I have decided to try to do a 30 day photography Challenge. Originally I was going to do a 365 day challenge, but I decided that was quite a commitment and that it would be better to start off small and see how it goes with the 30 first! 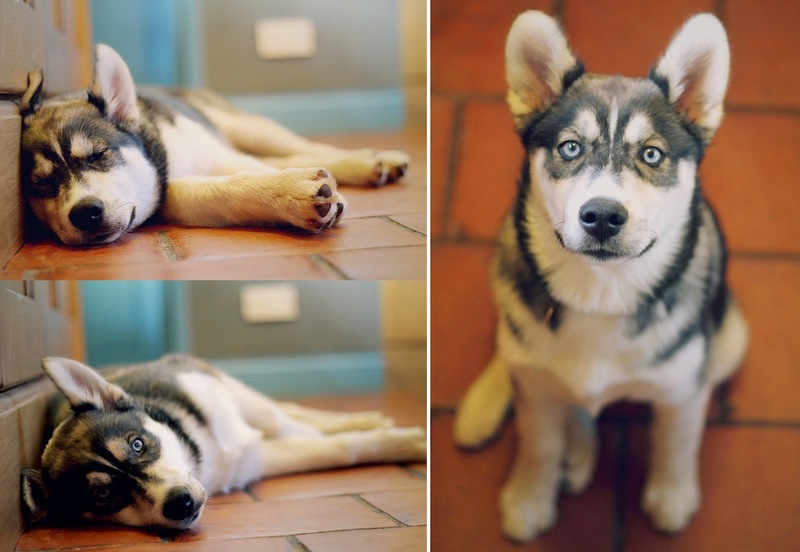 So today was my first day and, as I imagine will happen quite a lot on rainy days like this one, I took some shots of my husky puppy Amarouk. He is currently 5 months old and I have had him since January.He has the gentlest nature but can still be a bit of a scamp when he wants to be! Surprisingly for a puppy he is also a very easy model, offer him a grape or an apple and he is yours! Technically this is 3 photographs rather than one, but I liked all three of them too much to chose. The first 2 were taken while he was snoozing in my Kitchen this morning after his first walk (he has to have 3 a day to keep him happy); once he realized what I was doing and that there was a possibility of treats he sat up and gave me his full attention! I took these photos on my 50 mm prime lens, which is my absolute favourite lens at the minute it rarely leaves my camera, with a low aperture of f/2.4 to create that lovely shallow depth of field. Because of all the rain and white cloud outside, the light today is actually quite lovely, and I really like the soft lighting with the blues and oranges in my kitchen.